The Brush on Block applicator is self-dispensing and easy to refill with these additional cartridges that twist onto the base. Brush on Block is a brush-on sunscreen that’s easy to apply and nourishes your skin with botanical ingredients. Leading skincare figure Susan Posnick designed this SPF 30 powder for the whole family—light, non-greasy, and perfect for on the go. Material: Active Ingredients: Titanium dioxide 15%, zinc oxide 12%. This product provides reliable coverage, is easy and economical to use, and best of all is unscented. Highly recommended. So easy to use over your makeup. Doesn’t feel heavy. Love the unique items they sell. Prices are great . Easy, portable refill. Nice product line! Back off, sun. We’re armed with a brush. Brush on Block is a mineral sunscreen for the whole family, in powder form. The self-dispensing brush is mess-free and easy to take with you, holding a cartridge of SPF 30 powder inside—a couple of shakes and you’re ready to apply. When you run out, just refill the brush. 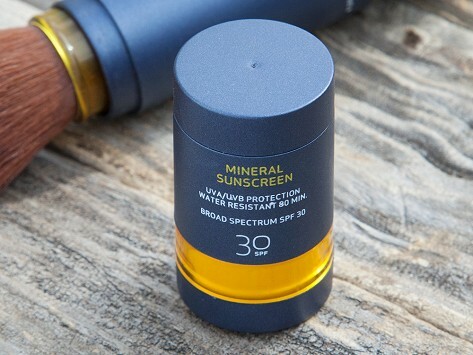 Naturally occurring minerals like titanium dioxide and zinc oxide protect skin. And botanicals like chamomile and green tea extracts enrich, soothe, and replenish it. 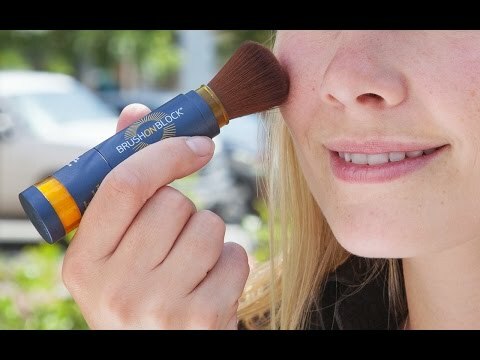 Because there’s no tint, you can wear it under makeup or over. Creator Susan Posnick is a beauty and skincare expert—the personal makeup artist to Mary Kay and other celebrities, Susan has her own cosmetic line. But when she was diagnosed with melanoma, she discovered her true calling. Today she’s a skin health advocate making better ways to protect your skin, like Brush on Block. Brush some on the kids before a bike ride (it won't sting their eyes like lotion), or apply it before golfing, skiing, or hiking. No greasiness, and no more sunburnt noses.